It’s been another chilly week. Your car or truck is parked outside. You open the door, slide into the seat, click into the seat belt, turn the key, and off you go. Except instead of the smooth ride you expected, it’s all bumps and thumps and the car seems to be vibrating. The chances are your tires developed flats spots when the weight of your vehicle pushed on them for an extended period of time on the cold street. Your tires spread out a bit and flattened where they touched the road. Because of the cold weather, the rubber stiffened, and the flat spots were still hard and flat as you drove away. That bumping noise is the sound of the flat spot on your tires slapping against the street. What should I do if my tires develop flat spots? Most of the time you can simply drive away the flat spots. 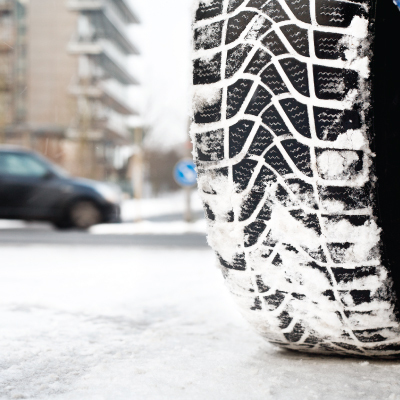 As you drive, your tires will get warmer and more flexible. Most of the time they will be round again within 15 minutes of driving. Unfortunately there are cases when flat spots become permanent. That can happen when a heavy vehicle is parked on a cold surface for an extended time, usually several months. What can I do to avoid flatspotting? – Make sure your tires have the correct amount of air pressure. When tires are low on air, they cannot hold a load as well as when they are properly inflated. – Be careful not to park your heavily loaded vehicle on a cold surface for weeks at a time. – If you have an exceptionally heavy load, you might consider jacking up your vehicle’s chassis to take some of the pressure off your tires. Which tires are more likely to develop flat spots? You might be surprised that it is not price that determines whether you get flat spots. Sometimes the most modern tire compounds are those that are the most vulnerable. High performance tires are particularly prone to flatspotting. That is because they are softer than other tires, they are designed to hang onto the road and corner at very high speeds. Softer, more flexible rubber compound can better grip the road. 1) More flexibility, so they flatten more easily when parked. 2) Wider footprints, so they pick up the temperature variations of the road more quickly. 3) Stiffer and shorter sidewalls that do not bulge much under weight, so the tread on the bottom of the tire flattens out more on the road. Don’t worry, check the air in your tires, and remember that if you encounter the thump of a flat spot when you start moving, it should go away as you keep driving.